OVERFUNDING: DUE TO ALL THE INTEREST AND OUR FUTURE PLANS WE DECIDED TO OVERFUND! AFTER OUR SUCCESSFUL RAISE OF THE INTIAL €350.000,- WE WILL CONTINUE TO RAISE MONEY. WE WILL USE THE EXTRA FUNDING FOR INTERNATIONAL EXPANSION. SEE OUR STATUS UPDATE ON OVERFUNDING. THANKS ALL FOR YOUR SUPPORT, LET'S CONTINUE TO FILL BOTTLES! Brands like Bacardi, Johnnie Walker, Martini and Absolut are amongst the most valuable assets in the world, worth billions and billions of Dollars. Imagine your Granddad would have had the opportunity, back in the day when these brands were founded, to invest and become one of the owners… Sadly, chances are he didn’t. Now here’s your chance to make up for that, for generations to come. Invest in this liquid gold and you and your offspring will have the best bar story ever. In 2016 entrepreneur Michiel Mol discovered a French traditional liquor in the South of France. Stunned by the flavor and the wide range of fans in the region, together with two other well experienced entrepreneurs he decided to bring a deeper, more innovative version to the international beverage market. Caramol was born. Caramol is a craft spirit based on a French local liquor from the south of France. With 24% alcohol, it's perfect to drink it "straight from the bottle" (as a shot), use it as a base for great cocktails (just as the bartender in the video seems to like it! ), as a drink before or after dinner (in restaurants), straight or mixed with soft drinks (Bars). A great product that tastes great and creates that wow factor/it’s own demand. A very compelling way to talk about it. The Caramol team. Proven successful in business. Success lies in connecting these five elements into something distinctive! A healthy margin per bottle. See the tab Sales Forecast in the Excel file of the Financial plan uploaded in the attachments for a complete overview. We tested, tasted, tested, tasted, tested, tasted and achieved in distilling a great and unique recipe! We also found a great combination of experienced and ambitious team members who are ready to turn Caramol into a global brand. Furthermore, we laid down the foundation for supporting this. Everything is aimed at the international expansion of the Caramol brand. € 1.500,- or more and get 6 x 50 cl bottles of Caramol and a “Drink it Like I Own It” T-shirt. 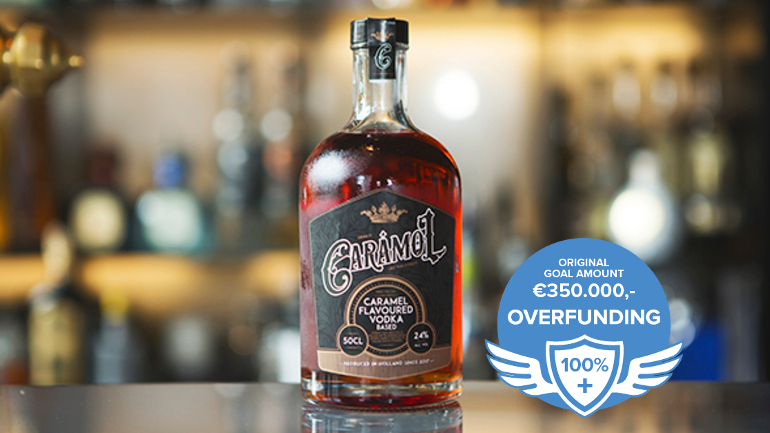 € 5.000,- or more and get 6 x 50 cl bottles of Caramol and a “Drink it Like I Own It” T-shirt, VIP Invite for the Dutch Caramol Launch Party. € 15.000,- or more and get 6 x 50 cl bottles of Caramol and a “Drink it Like I Own It” T-shirt, VIP Invite for the Dutch Caramol Launch Party, VIP Invite for the International Saint-Tropez Caramol Launch Party and a limited edition 4,5 liters Réhobaum bottle of Caramol. €50.000,- or more, a limited edition 4,5 liters Réhobaum bottle of Caramol, your name on the etiquettes of every Caramol bottle that will be produced from here to eternity and a Hitchcock-like cameo appearance in the next global Caramol commercial. Eternal fame awaits you. Michiel Mol is one of Europe’s most successful e-businessmen of the past decades. Having graduated from Leiden University with a degree in Computer Science and Mathematics, he started his own company Lost Boys international (LBi) which was sold to a subsidiary of WPP in 2013. In addition, he founded Media Republic, Guerrilla Games and Force Field VR. Michiel is also a co-owner and board member of Sahara Force India Formula One Team and advertising agency The Communication Company. After earning his degree in Law at Leiden University, Maarten Elshove started his career in finance. Having worked at various large corporations, such as ABN Amro and KPMG, he developed his entrepreneurial skills and became the director and owner of MaxCredible, which grew out to be a leading firm in customer credit management software. Maarten is co-founder of NTC and is co-owner of MM Ventures and CFO of advertising agency The Communication Company. As a former Dutch Special Forces officer, Niels has travelled the world and during his R&R’s around the globe he became more and more intrigued by the various flavors the world has to offer. After his military career, he joined the infamous Copperhead Gin company where he was responsible for sales and marketing. Later he started Sir Edmond and is now involved in Caramol. Here’s a man who knows how to introduce a AAA liquor brand. An international salesforce will be created to assist importers and to ensure further market development and growth. Caramol is a craft spirit based on a French local liquor from the south of France. The French liquor involves a caramel infusion. After infusing caramel in pure vodka, the liquor is stored in a deeply cooled environment. The liquor is infused for several months, similar to the Spanish Hierbas. Because its unique flavor profile and wide possible range of consumption possibilities, Michiel Mol developed the fresh liquor into Caramel. Caramol can be used as a shot (in the club scene), a base for cocktails (in the cocktail scene), as a drink before or after dinner (in restaurants), straight or mixed with soft drinks (Bars). Comparable to the likes of Amaretto or Patron Tequila, Caramol is a broad and diverse product which creates a unique opportunity. A good healthy margin per bottle. Added value in the brand. For more detailed information please see the investor-plan. Because the Caramol Team is hands-on and already successfully experienced in building an international brand, the scalability is guaranteed. The distillation and production is done by Herman Jansen Beverages. Together with BOLS they run the largest distillery in Europe. This provides the foundation to supply Caramol on a global scale. Everything is set at international growth. We achieved in distilling a great and unique recipe. Created an experienced and ambitious team ready to turn Caramol into a global brand and laid down the foundation for supporting that. Everything is aimed at global international expansion of the Caramol brand. We will keep looking for new possibilities. Along these possibilities are for example launching specific cocktail ideas, or expanding the line with different tastes. The international beverage industry is finally seeing a “craft” movement take hold across bars and retail outlets in a way that could mirror the success craft beer brewers have had in recent years. Alcohol is nearly consumed by every human being over the globe. Making the beverage industry one of the largest industries over the world. Comparable to the likes of Amaretto or Patron Tequila, Caramol is a broad and diverse product which creates a unique opportunity in a target audience of people aged 21 to 51. This growth is expected to get continued support from retailers and wholesalers, likely because they’ve seen the success craft brewers have achieved in the beer world. Within beer, craft producers now control about 12% of total market volume and are posting growth rates that far exceeds the total category. Why is “craft” becoming a hit in the liquor world? There’s been a broad shift in a variety of beverage categories to sell more craft items that are deemed premium. The consumer-led movement is most advanced within beer, but craft is happening in spirits, soda and coffee, among other beverage categories. Some experts say “craft” can capture as much as 30% of the market in the beverage world…none of the sub-segments are even close to obtaining that market share. The growing popularity of craft spirits has led to some deal making, similar to what the beer world has seen in recent years. Some recent transactions include Constellation Brands’ $160 million acquisition of High West Distillery, Pernod Ricard’s separate $150 million deals for Monkey 47 gin and Avion tequila, Campari’s $100 million deal for acquiring Bulldog gin and Bacardi’s takeover of Angel’s Envy bourbon. If support from consumers and retailers mirrors the success brewers have had, the potential for craft spirits disruption can be even more massive. Comparable to the likes of Amaretto, Baileys, Licor 43 (Cuarenta y Tres) or Patron Tequila. But all alcoholic beverages can be seen as competitors. But since Caramol is a broad and diverse product which creates a unique opportunity we see plenty of opportunities! Customer feedback has been overwhelming. Everyone who tastes Caramol is blown away by its unique flavour. Even while Caramol is not on the market yet, Heineken is already willing to list it. Also 4 other wholesalers want to list the product. Besides the off-trade we have already 87 bars in The Netherlands and 121 venue's internationally who are waiting for Caramol to be on the market. Willing to put it on their bars! Build a steady showcase in The Netherlands. Set an international growth plan with country targets. Find key importers/distribution partners in targeted countries. Create and drive an international salesforce to assist importers and ensure further market development growth. Implement the marketing and sales strategy per country. Cultivate/farm with each importer and develop long-term relationships with them. These steps should lead to a continuous base of new customers. So far, we have built the brand strategy and set out the story to our first contacts. Heineken is already willing to list it. Also 4 other wholesalers want to list the product. Besides the off-trade we have already 87 bars in The Netherlands and 121 venue's internationally who are waiting for Caramol to be on the market. Willing to put it on their bars! Build an external distribution network thru wholesale. (Availability) 1 month. Product placement in the top 50, high-end and leading on-trade. (Cultivate) 1 month. Product placement in 350 targeted mid segment on-trade venues. (Farm) 3 months. Product placement in the top 50, high-end and leading off-trade. (Retail) 1 month. Product placement in 350 targeted mid segment off-trade stores (National) 3 months. Farm (Maintain and grow further) indefinitely. Marketing is essential in launching a new product in the market. To support sales, Caramol will develop a wide range of marketing tactics and tools to activate the brand. A detailed target group will be defined and marketing efforts will be created accordingly to communicate to those segments. POS Materials (Brand books, Ice Coolers, Glassware, Bar tools, Displays, Bars, Dummy-bottles, etc) This catalogue will be available for importers and agents. To offer to the on-off trade or to be used on conventions, bar shows or marketing events. Importers can order items via the POS budget they get per ordered bottle. (1 euro per bottle calculated). Sample Bottles (Handouts and sample giveaways) – (Estimated 250 liter per country). Organize and host dedicated Caramol events in the on-trade (consumer and trade orientated) to create a brand experience for the target audience. Support openings, parties, fashion shows, racing events, national events with product or with the Caramol Bar. Create a online / social media strategy and several Caramol platforms on Instagram, Facebook, Pinterest and Twitter. Create an unique and recognizable identity. A known bartender from the high end cocktail scene will be appointed as brand ambassador. To host masterclasses, support as a (star) bartender on events and to build the brand to an established level. He will be the spokesperson into the on-trade scene. Caramol will be present in the top 6 bar conventions or retail orientated events. This will be supported from the brand itself and not from the importer/agent. Events like, The Perfect Serve Barshow, Tales of the cocktail, The Liquor Convention or Berlin Bar Convention. (6 per year per country – in consultation with the importer/agent). Per country an PR agency or PR agent will be appointed for press, bloggers, vloggers etc. and to search out the right events to support with product placement. (give-aways). - Right Spirits as the Dutch agent. - Herman Jansen Beverages for production and distillation. Since we will launch the product in June we calculate from May till May. The projected turnover comes out of experience of bottle sales and brand-building for Copperhead Gin, Sir Edmond and other brands. Another assumption is that, via the network of the experienced team, the Caramol brand will be picked up by vendors, resellers and end consumers. The first year we expect to at least launch in The Netherlands and the UK. € 28,000 of own capital. But we will make use of the overfunding possibility if possible since we expect to need new funding in 2018. You will invest in a convertible loan with 8% simple interest rate. In our financial plan we expect future funding which gives you the option to convert to shares. When no future funding is necessary we tend to convert after the period of 5 years (see convertible loan agreement). Caramol takes over the world. Crowdfunders can expect a nice return on investment with the option for a buyout. Sale of Caramol to bigger company. Tool one time span for market adoption. Fail to get vendors or reseller contracts in the Netherlands or abroad. Competitor that brings a product with similar taste to the market. We don't succeed in raising follow up investments.